Costa Bayside sunglasses are ideal for a relaxing day on the water. These rounded glasses are made with TR-90 and bio-resin material to make them durable and even environmentally friendly. Costa shades are built with the toughest components, innovative technology, and ultra lightweight beta-titanium to provide the best outdoor experience. Bayside sunnies are a lifestyle frame, but don't let that fool you, these sunglasses are still equip to perform. Features include ventilation ports, hydrolite temple pads and pin hinges. 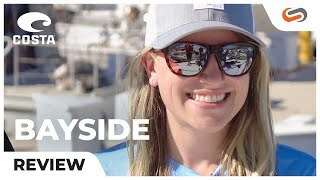 Costa Bayside prescription sunglasses perform, explore, and protect.